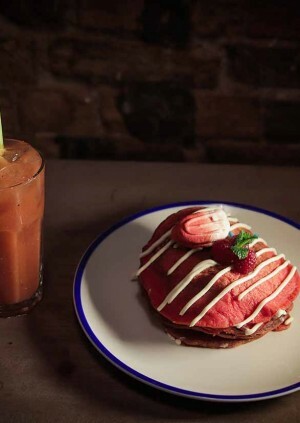 The Book Club in Shoreditch will be serving up Red Velvet ‘period pancakes’ garnished with tampon macaroons from Ohlala bakery in support of period poverty charity Bloody Big Brunch. The Pancakes will be available all week including on pancake day from Sunday 3rd March to Sunday 10th March, with 15% profit from each dish sold going to the charity. Bloody Big Brunch aims to raise awareness of and funds for period poverty, as well as destigmatizing conversations around periods. Their research this month has revealed that shame around menstruation is still widespread, with half of people currently describing periods as unpleasant or disgusting - but 69% of people, including men and boys, wish that we felt more comfortable about them. Almost 3 in 10 women and girls throughout the country have been unable to afford menstrual products, with more than a third of those (38%) bleeding through most days of their period and 26% missing school or work. The pancakes will launch on Sunday 3rd March, when Bloody Big Brunch are encouraging people across the UK’s to take part in the biggest brunch in the Uk. Amika George will host and Jess Woodley of Made in Chelsea, Grace Woodward and Tom Read Wilson of Celebs Go Dating will be attending, with DJs and drag entertainment at The Book Club during the day. More information on how to support at www.bloodybigbrunch.com. Buy your brunch essentials here: https://bit.ly/2N5qn5V. If you’re not based in East London, the Bloody Big Brunch has cooked up a simple solution, asking people to host their own brunch at home and serve Bloody (or Virgin) Marys to friends and family. But there’s one string attached - and it doesn’t come at the end of a tampon. Guests must pay for their drinks with period products, which they can do easily by purchasing Hey Girls, who will automatically double donations and distribute products to charities around the UK including The Red Box Project, Bloody Good Period, Girlguiding Scotland, YWCA and Freedom4Girls. In the last year, the Bloody Big Brunch has hosted events that have helped over 5,000 women gain access to period products they could not have afforded otherwise. By empowering members of the public to hold their own brunches on 3rd March, the aim is to raise this number to 10,000 - and also put pressure on the UK government for lasting legislative change. The Bloody Big Brunch was originally created by WIRE, a creative agency, who wanted to provide an easy way for people to campaign for change. Previously, the Bloody Big Brunch was a travelling brunch event that asked people to pay for their Bloody Marys with period products. Brunches have already taken place in Glasgow, London, Edinburgh and Manchester attracting over 5000 donations so far. They have since partnered with Hey Girls who believe that access to menstrual products is a right, not a privilege. As a Social Enterprise, they have one clear goal: for every pack of Hey Girls sanitary products sold, a pack is given away to a girl or young woman in need in the UK. Hey Girls pads are a no-leak, super comfy, chlorine and bleach free, environmentally friendly product. They’re made from sustainable natural bamboo and corn fibre and come in biodegradable wrapping and recyclable packaging. They also sell 100% organic cotton tampons, and re-usable pads and menstrual cups. Hey Girls pads are available to buy from 228 ASDA stores across the UK. The full range of products is available to buy direct from the Hey Girls website.